Submitted by Mason Hoberg on Oct. 22, 2017. Finding the best drum sticks can be a challenge. There’s so much that goes into how they’re designed, and if you don’t get the right type for your needs and skill level you’re not going to get the tone or response you want. So if you’re not sure which set of sticks, brushes, or mallets is going to work best for you check out the recommendations below. 95 out of 100. Incorporating 2300+ ratings and reviews. Vic Firth’s American Classic Wood 5A Drum Sticks are made from hickory, a dense and tough wood known for its durability. Hickory is of a medium weight, being roughly 10% heavier than maple but 10% lighter than oak. 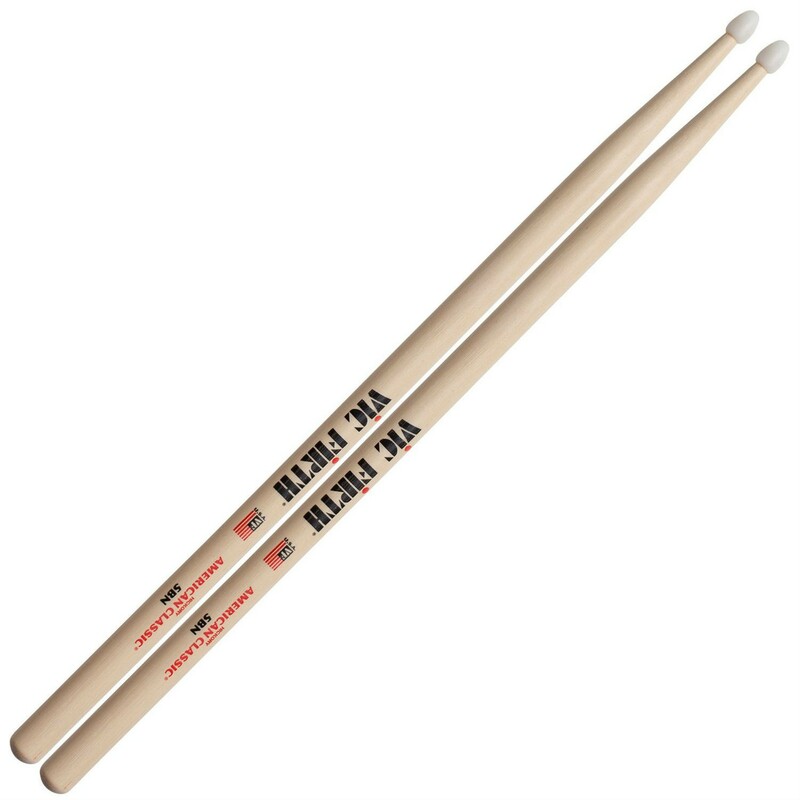 Because of their hickory construction, the 5A set is a great fit if you’re looking for a versatile pair of drum sticks that won’t let you down. The tips of the 5A set are deeply back-cut, which gives them a very articulate and bright cymbal response. The set also has a medium taper, giving them a very balanced feel. Even better, because of the taper the sticks can produce plenty of volume without sacrificing control over your dynamics and positioning. 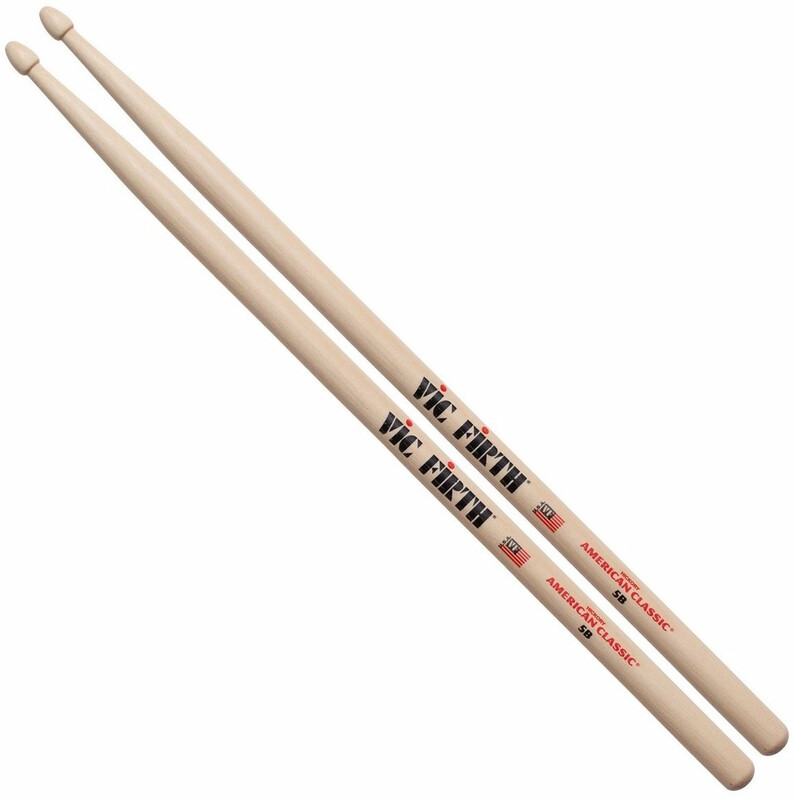 Because of the material used, the taper, and the back-cut tips, Vic Firth’s 5A drums sticks would be a great starting point for beginner drummers. Because of the sticks’ design they’re very easy to control, which will make it easier for drummers who are just getting their start to get a handle on different techniques without being held back by drum sticks that require more effort to use. 95 out of 100. Incorporating 900+ ratings and reviews. The Fic Firth American Classic 5B set is similar to the 5A set. It’s still made from hickory, which as stated above gives it a really nice combination of power, durability, and dynamic range. However, the B models are significantly wider than the A models. This translates into more weight, which means that you’ll have a harder time controlling your dynamics. However, you’ll also have a higher maximum volume. While the increase in weight makes the B models a bit hard to handle, it does make them a great fit for genres that benefit from a louder and more intense tone but don’t require a lot of intricate techniques. Think rock and roll and more upbeat blues. Harder genres of rock and metal definitely benefit from heavier sticks as well, but the heavier sticks can make more intricate fills and rhythms harder to pull off. 95 out of 100. Incorporating 300+ ratings and reviews. Vic Firth’s American Classic 5BN set is the nylon tipped version of the American Classic 5B set. Wood and nylon create a very different feel and response, so most drummers have a strong preference for one type or another. Nylon tends to have a brighter tone than wood. Interestingly, while it is brighter it’s also considered to be less articulate than wood. The material is also said to have a more consistent tone than wood, which comes in handy if you’re doing a lot of intricate cymbal work. Wood is considered to sound better on toms, which is why many rock and pop musicians prefer it. Lastly, if you’re playing jazz or other more traditional genres you may not get the tone you’re looking for. Nylon, while a great material in its own right, doesn’t have the warmth of wood (which older genres really benefit from). 94 out of 100. Incorporating 375+ ratings and reviews. The signature stick of Ralph Hardimon, a Grammy nominated percussionist and teacher, the Vic Firth Corpsmaster Wood Drum Stick set is a barrel tipped pair of drum sticks with a long taper. The barrel tips create a full and dark tone, great for snare work. However, if you’re looking for a more clear and defined tone you’re going to want to go with a pair of sticks that has a smaller tip. The Corpsmaster sticks are coated with paint, which some musicians will love. Paint gives a less “grippy” feel, and creates a stick that is less prone to damage from changes in temperature or humidity. However, if you ever have issues with your sticks flying out of your hands while playing you may want to find a non-coated stick (or rough up the surface of the Corpsmaster set with steel wool). 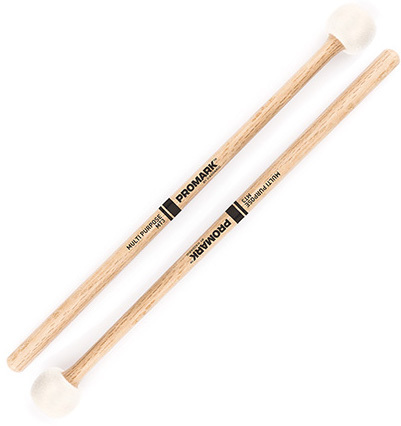 Lastly, the Vic Firth Corpsmaster Ralph Hardimon set is made from hickory. Because of the set’s length and diameter it will be noticeably heavier than the sets above. 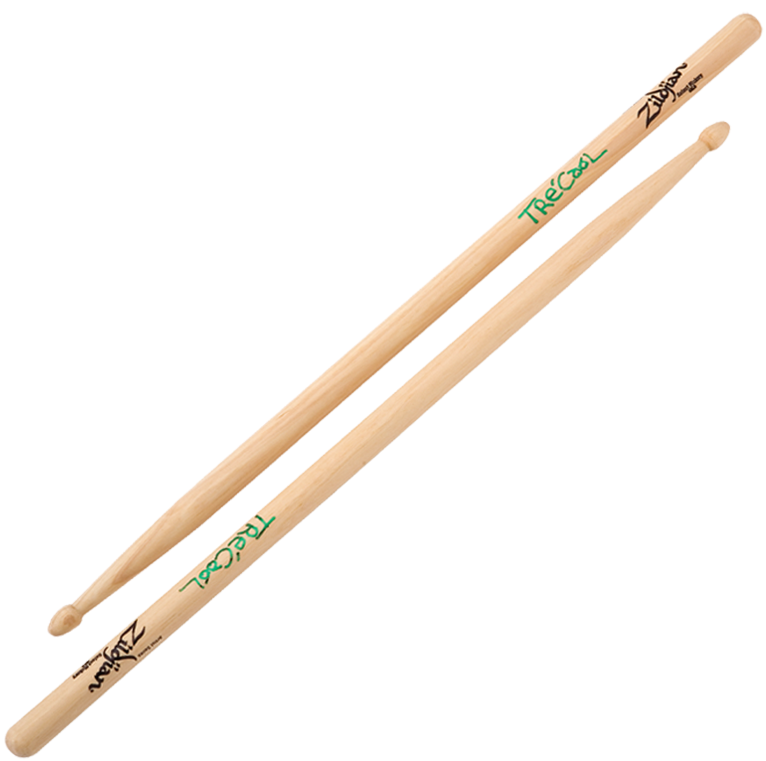 The signature stick of Green Day’s Tre Cool, the Zildjian Artist Series Tre Cool Drum Sticks are a great choice for any drummer looking for a great punk and/or rock sound. These sticks work excellently for genres with hard, driving rhythms. The main strength of these sticks is their short taper. While the taper isn’t stated on Zildjian’s website, they’re definitely on the shorter side when compared to some of the sticks we’ve already featured. A short taper produces a “front-heavy” feel, which makes it easier to play loud and to play quickly. This is also helped by the sticks’ 16 1/2” length. With that being said, a more balanced stick may be preferable for beginning musicians. A short taper gives more power at the expense of some control. Older musicians (like teens and adults) might not notice as much of an issue, but it will definitely impact younger musicians. 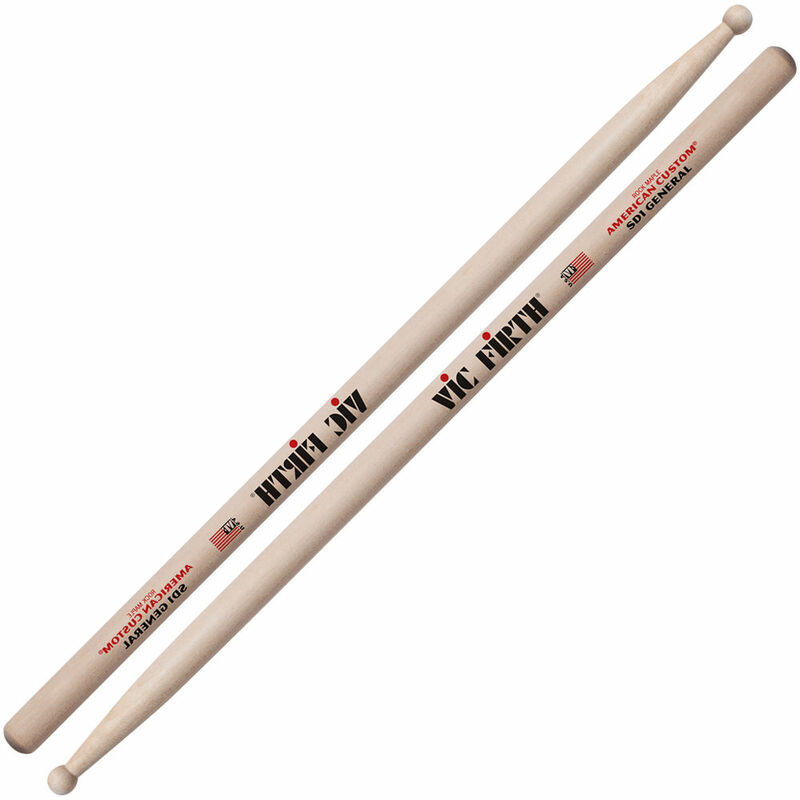 Vic Firth’s American Custom SD1 General Drum Sticks are a round tipped set of drum sticks that are great for just about everything, hence the “general” name. The cool thing about these sticks is that there’s nothing about them that’s going to hold you back. They’re not going to excel at everything, but if you’re looking for a versatile set of sticks you definitely can’t go wrong with these. Part of the reason why these sticks are so versatile is that they have a tip with a small surface area and a (relatively) long length. The small surface area of the tips means that you’re transferring less force into your hits, so it’s easier to back off and get more subtle tones. Likewise, the long length allows you to dig in more for louder passages. The short taper makes playing faster passages easier, and because of the small surface area of the sticks you don’t lose as much control over your volume. 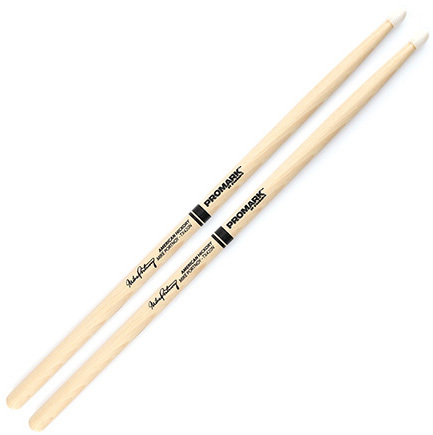 The Promark Hickory 420 Mike Portnoy Nylon Tip Drum Sticks are a bit different than what we’ve covered on this list before, most notably the oval nylon tips. Nylon has a much brighter sound than wood, which is a huge asset if you’re going to be doing a lot of cymbal work. Wood tends to provide a fuller sound on toms, which is why many (though definitely not all) rock drummers prefer it. 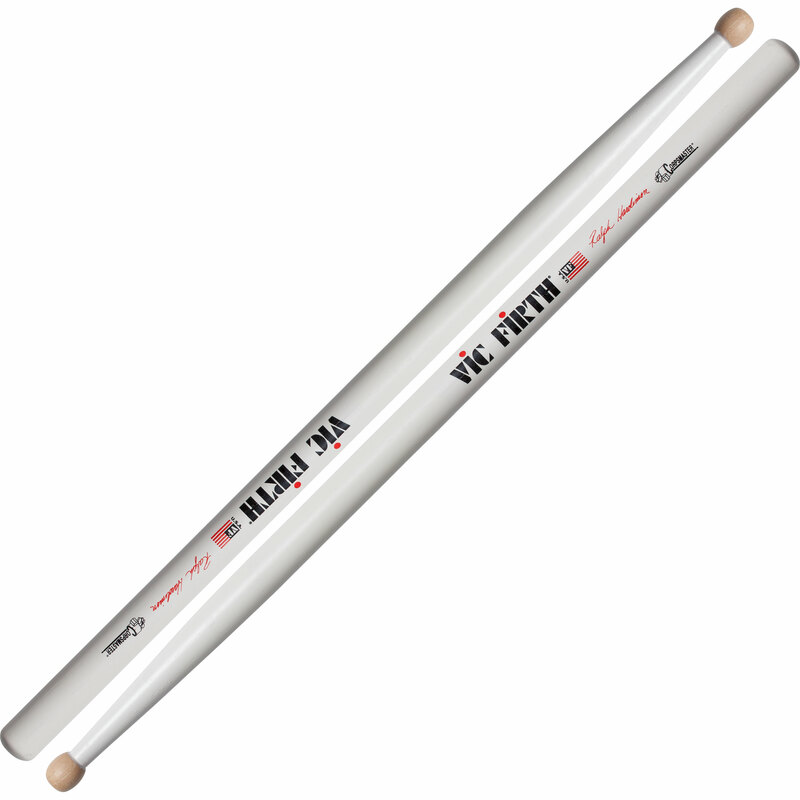 These sticks also have a short taper, which is great if you’re looking to play a lot of fast and hard hitting passages. It’s also important to know that the taper itself is relatively subtle compared to a lot of the other sticks we’ve gone over, so the “front-heavy” feeling is going to be a bit more noticeable. These sticks are made from hickory, which is a great middle of the road wood in regard to weight. It’s not too heavy to be unwieldly, but it’s not too light that it’s hard to get a full tone out of it. Drum brushes are used for softer playing at low volumes. While distinct from sticks, they’re an important part of every drummers tool kit. They’re great in jazz, pop, and even Latin music and more, the only real limit is your imagination!. Unlike sticks, the main thing that decides your tone when you play brushes is the diameter of the wire as opposed to the stick itself. The Jeff Hamilton Retractable Brushes use a relatively thick gauge of wire (the thickest used by Regal Tip), which gives them a warmer tone and more volume than brushes with a thinner gauge of wire. This helps the brushes to cut through other instruments, which is a huge plus if you’re playing in a bigger band. Lastly, as you’d guess from the name, the wire of the brushes is retractable. This is going to be a huge asset if you ever plan on playing live, because you don’t have to worry about your wire getting bent in transit. Steve Gadd is arguably one of the most sought-after session musicians in the world, having played in the studio for a diverse range of musicians such as Simon & Garfunkel, Steely Dan, Eric Clapton, and James Taylor. An interesting feature of this brush set is that the wire is actually angled, which helps to keep your brushes from snagging on (fresh) coated drum heads. Essentially, they angled the wire only in the last ¾” of the playing end of the brush. So you still get the same feel as a normal set of brushes, without having to worry about snags. Even better, you still retain a traditional tone. 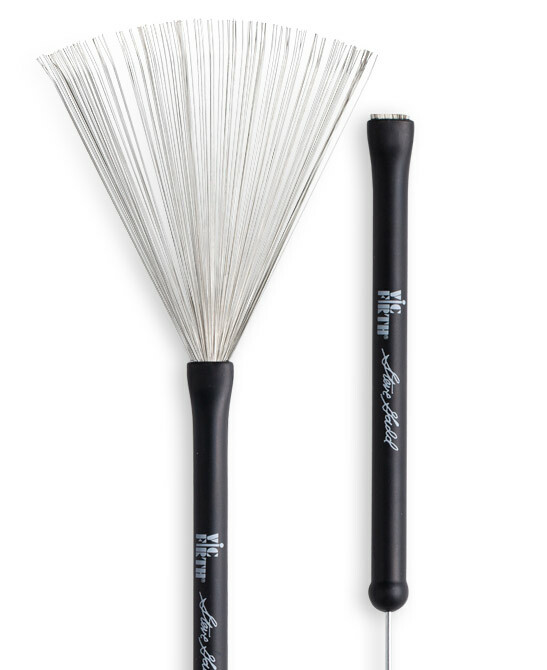 The Vic Firth Steve Gadd Wire Brush set also uses a rubber handle. The rubber handles help to prevent your hand from slipping off the handle of the brush while you’re playing. Mallets expand your tonal range by allowing for a softer attack than sticks but provide more impact than brushes. Promark’s MT3 Multi-Purpose Felt Mallets are made from Shira Kashi Oak, which as covered below are roughly 10% heavier than hickory. This increase in weight creates a greater volume and a darker tone, which depending on what you’re looking for could be a huge asset. Another cool thing about these mallets is that they have a gradual taper. The gradual taper means that you feel more weight the farther your hands are down the mallets. This means that the sticks have a very “front-heavy” feel, which facilitates fast motions. While these mallets are said to be great on timpani, concert toms, and cymbals, they’re said to be the ideal mallet for cymbal swells. Lastly, because these sticks are made from oak (which is a dense wood) your odds of breaking a stick are very low. This alone makes the sticks worth serious consideration if you’re a gigging musician. 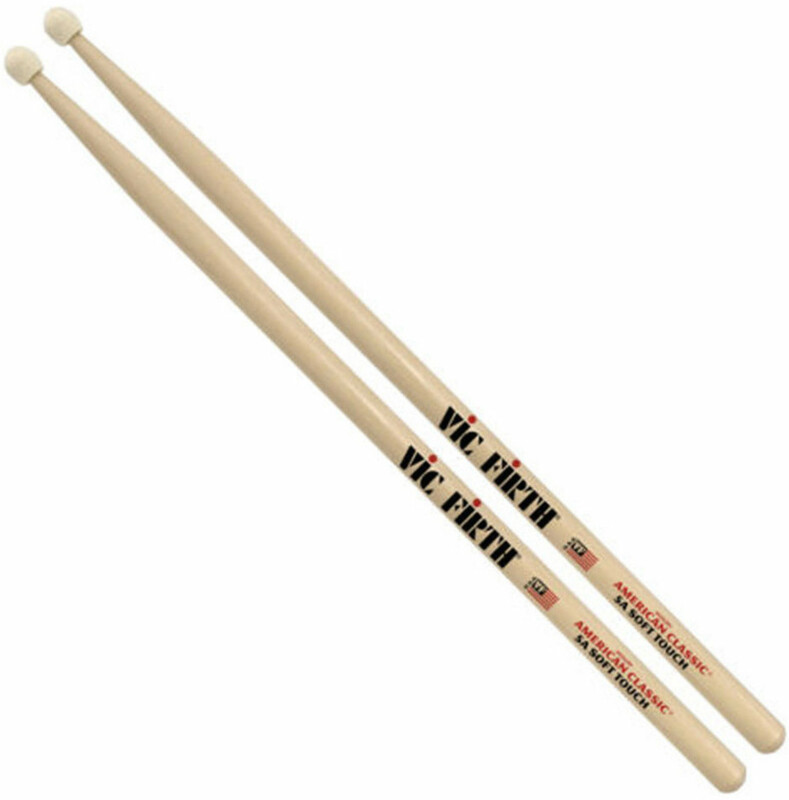 Vic Firth’s Dual Tone 5A Drum Sticks/Mallets are essentially a 5A drumstick on one end and a (synthetic) felt tipped mallet on the other end. Basically, this set is a perfect fit for the drummer who’s looking to quickly switch between a standard drum head and a mallet without having to try switching between different types of stick. With that in mind, as stated above these sticks are basically normal drums stick with a mallet on one end. This means that they aren’t going to be as good as a dedicated mallet, so if you’re looking to get a proper mallet tone and response you may be happier going with a traditional option. However, as far as the stick end is concerned you aren’t going to notice a huge difference between this set and a normal Vic Firth 5A set (once you get used to the felt on the end of course). It’s still made from hickory, it has a medium taper, and it’s only an eighth of an inch longer. If you’re looking to learn more about drum sticks, check out the sections below. We’ll cover what goes into a stick’s design, what they mean for your sound, and how to choose a stick based on how you play. As a general rule, the heavier the stick the louder your drums and cymbals are going to be though this does come at the expense of some dynamic range (the amount of volume you can get between soft and loud). Lighter sticks have a greater dynamic range and a bright tone. Maple is the lightest wood commonly used for drum sticks, though it tends to wear out the fastest. Hickory is much stronger, and roughly 10% heavier than maple. Oak, roughly 10% more dense than hickory, is the heaviest commonly used drum stick wood. Length is arguably one of the most important factors of a drum stick, because it has a huge effect on how your drum stick feels to play. The longer a stick is, the more reach and leverage you have. More reach makes it easier to his different pieces of your kit, and the extra leverage means that your stick will require less effort to hit hard. With that being said, the benefits of a longer stick depend on how you play. If you like to have more control over your volume, you may prefer a shorter stick. Likewise, if you play with a more minimalist kit you may find that the extra length of longer drum sticks just gets in your way. Diameter, or how thick a drum stick is, impacts its weight, durability, and its volume. A thicker diameter creates a stick that can be shorter while still having good volume, or a longer stick that isn’t so heavy it becomes unwieldy. Taper is the difference between a stick’s thickness at its point and at its end. A long taper gives you a stick with more flex (so you can hit harder with less effort) and a faster response. A short taper gives you more volume but it will feel heavier and take more effort to play. A medium taper is the middle-ground between the two. 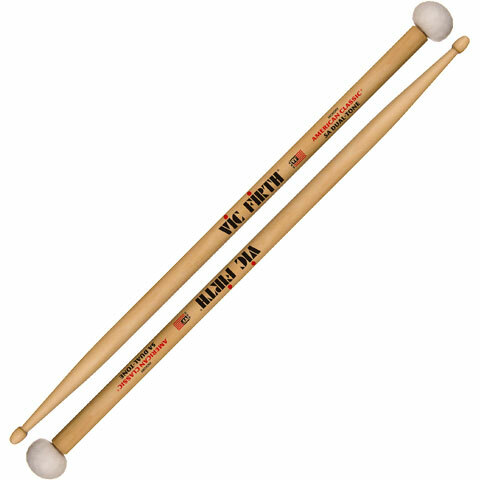 Drum sticks have two commonly used tip materials: wood and nylon. Wood is the most common material, and is generally considered to have a warm and responsive tone as well as great articulation. Nylon has a brighter tone and more durability, though this does come at the expense of the articulation associated with wood tipped drum sticks. A reality of life as a drummer is that eventually you’re going to break a drum stick, or your drums stick will fly out of your hand at the worst possible time (like in the middle of a gig). Because of this, it’s important that you have multiple sets of drum sticks. Think about it this way. Imagine you finally get some time to practice. You warm up for a few minutes, collect whatever practice materials you use, and get ready to spend some time with your instrument. Then, as soon as you start really playing, your drum stick breaks. If you have a spare, you can get right back into practicing. If not, than you’re going to be pretty (understandably) upset. Even worse, if you don’t bring spares to a gig you could potentially disrupt an entire performance in the event that you break or drop a drum stick. It’s generally recommended that for a gig you bring at least five pairs of extra drum sticks (so six in total). Thankfully, drum sticks are affordable enough that either of the situations above are very avoidable. Just be sure that if you’re playing, you always have a spare close at hand. There are a LOT of drum sticks on the market. In fact there are so many that when we looked at all the sets of drum sticks available from major American online music gear retailers, we ended up needing to put 77 sets of sticks, brushes and mallets on our short-list for closer examination in order to ensure we would recommend the highest rated options available. We then collated ratings, reviews and comments from online stores, discussion forums, review sites and major gear publications to process with the Gearank Algorithm to produce scores out of 100 for each set - in fact more than 11,200 sources were used during this procedure. We then selected the highest rated options in each of the 3 categories above to recommend. For more information about this process please see How Gearank Works.